Some of us may be unfamiliar with the many tech terms that spruce up every so often. Firewall can also be a term that not many are familiar with. According to a study by National Cyber Security Alliance, only 4 percent of Americans say they understand firewalls “completely”, while more than 44 percent don’t understand firewalls at all - or know if they have one enabled on their PC. So for those who feel unsure, keep reading to find out why a firewall is a necessary part of your online defense. If your PC is connected to the Internet, you are a potential target to an array of cyber threats, such as hackers, keyloggers, and Trojans that attack through unpatched security holes. This means that, as you shop and bank online, you are vulnerable to identity theft and other malicious attacks. A firewall is a software program or piece of hardware that helps screen out hackers, viruses, worms etc and works as a barrier, or a shield, between your PC and cyber space. Your computer is more susceptible to being attacked when you are accesing your internet via your PC, you can restrict outside access to your computer and the information on it with a firewall. What are the types of firewalls out there? Firewalls can be either hardware or software but the ideal firewall configuration will consist of both. In addition to limiting access to your computer and network, a firewall is also useful for allowing remote access to a private network through secure authentication certificates and logins. How does a firewall work and protect my computer? When you are connected to the Internet, you are constantly sending and receiving information in small units called packets. A firewall filters these packets to see if they meet certain criteria set by a series of rules, and thereafter blocks or allows the data. This way, hackers cannot get inside and steal information such as bank account numbers and passwords from you. Basic firewalls such as the one included in your Windows, only monitor incoming traffic by default. This may give you a false sense of security. Keep in mind, outgoing traffic, with your credit card information, bank accounts, and social security number is not protected. A good firewall will monitor traffic in both directions. That is, both your incoming data and your outgoing data, keeping your private information safe. In addition to preventing unauthorized access to your PC, it also makes your computer invisible when you’re online, helping to prevent attempted intrusions in the first place. Also important to keep in mind: although a firewall provides critical protection to keep your PC safe from unauthorized access, it cannot remove malware from a system that has already been infected. Due to that, a firewall should be used in combination with other proactive measures, like anti-malware software, to strengthen your resistance to attacks. Anti-virus software. A virus is code that recursively replicates a possibly evolved copy of itself. Viruses use computers to spread from one to another. They often perform a function that can erase files and processes from your computer. Anti-virus software can protect your computer from a range of cyber threats like viruses, worms, rootkits, and phishing attacks. The software keeps you protected by scanning files to look for known viruses, and by using what is known as heuristics to identify suspicious behavior which may indicate a threat. Combining our legendary anti-spyware with a powerful antivirus, adaware antivirus free enhances them with real-time protection, download protection and continuously updated filters against malicious URLs, providing top-of-the-line anti-malware protection for the casual computer user. adaware antivirus personal provides a complete set of anti-phishing features and real-time web-filtering technology that safeguards your PC against phishing attacks and online scams, giving you the confidence you need to shop and bank online. Complete line-of-defense against the most extreme forms of malware and cyber threats, adaware antivirus pro provides the most advanced anti-spyware and antivirus detection and threat blocking algorithms, complemented with a powerful two-way firewall, web filters against phishing attacks and real-time email protection. Our most comprehensive line of defense, adaware antivirus total provides multiple layers of protection for complete PC security, including antivirus and anti-spyware, firewall, anti-phishing, email protection, parental control and more, as well as a complete set of data security features like file encryption and digital shredder. For more information on additional tools to maintain your PC's health and security, see our articles: Tuning Up Your Computer and Keep Your Information Under Your Control. 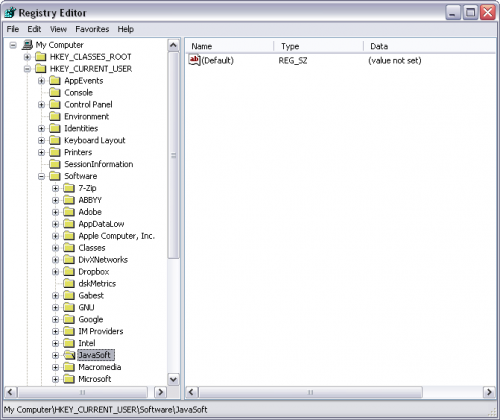 The system registry is a database of essential file references to applications and utilities. Its structure is hierarchical. The registry is structured with nodes of information that contain keys and sub-keys. To access the System Registry is quite easy. Do not make any changes until you have done a backup of the Registry. If any incorrect change, you may not boot your OS. The Registry Editor window displays. Sometimes, to clean your infected computer and eliminate the consequences of the infection, it is necessary to make changes in the Windows system registry. When editing the system registry, it is recommended to strictly follow the adaware Expert’s guidelines. Temporary Internet Files is a folder on Microsoft Windows which contains Web page content that is stored on your hard disk. Internet Explorer and other web browsers uses this directory to cache pages and other multimedia content, such as video and audio files, from websites you visit. This feature improves network performance allowing such websites to load more quickly the next time you visit them. 1- Open either Internet Explorer (8.0) or the Control Panel. With Control Panel, double-click Internet Options. In either case, the Internet Properties window appears. 3- On the General tab, click Delete under Browsing History. 4- With the Delete Browsing History dialog box, select the Temporary Internet Files check box, and then click Delete. Let's be honest, no one wants to own a computer that is infected with malicious programs. Therefore, it is imperative to practice safe computing habits. You can avoid most malware just by staying away from a few common traps. Cybercriminals are constantly trying to find holes or vulnerabilities to exploit, and new threats are emerging every day on the web. To stay protected, it is important to have the latest version of the software you are using. Unfortunately, every so often malware get beyond our defenses even though we are careful. Maybe our anti-virus software is out of date or has been compromised by a particularly clever bit of code. Perhaps we clicked on a link by accident and activated a virus. Or someone else used our computer and downloaded some malware by mistake. 1. Your computer is running extremely slow. This might be a symptom of an infection by a malware. If your computer has been infected by a virus, worm or Trojan, they could be running tasks that take up a lot of resources making your computer system run more slowly than usual. If you are not running a resource-heavy application but your computer is very slow, you might have a computer virus. 3. Your computer has gone unstable. That is another sign that something is wrong with your computer. Most malware messes around with important files that halt your computer running properly. That could cause your computer to crash. If your computer crashes when you try to run a specific application or open a particular file that tells you that something has corrupted the data. It could be malware. 4. Your Antivirus and firewall protection is unexpectedly disabled. This is yet another common characteristic that your computer may be infected. If all of your security components such as your antivirus and firewall have automatically been disabled without your consent, it is most likely a malware has deactivated your antivirus protection. For that reason, you should continuously check that your antivirus is working and running at full protection. 5. Unfamiliar and peculiar error messages. If you are continuously getting error messages indicating that your programs won't run or your files won't open, it might be another sign of infection. Strange messages indicating that you can't access certain drives on your computer. Hardware such as USB keys and printers are not responding to commands. File sizes are fluctuating even if you aren't accessing those files. Don't have a firewall installed on your PC? Look no further, adaware pro security is our complete line-of-defense against the most extreme forms of malware and cyber threats, packed with valuable features that includes a powerful two-way firewall. Our two-way firewall complements and enhances the protection offered by your typical router and provides more robust security than the built-in Microsoft Windows Firewall (they only check for incoming data) by monitoring which applications are attempting to send data out (outgoing traffic). In simpler terms, what it does is block hackers from getting into your system to steal important information. Download adaware antivirus pro here. Open either Internet Explorer (8.0) or the Control Panel. With the Delete Browsing History dialog box, select the Temporary Internet Files check box, and then click Delete. 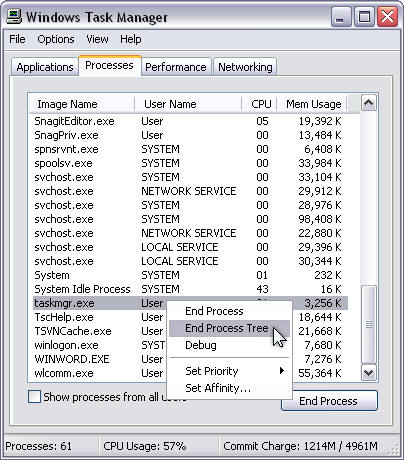 The Task Manager provides detailed information about computer performance and running applications, processes and CPU usage, commit charge and memory information, network activity and statistics, logged-in users, and system services. 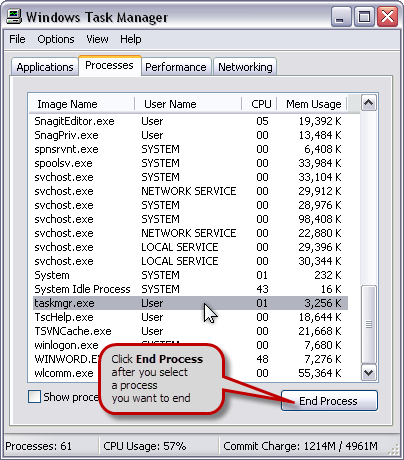 You can use the Task Manager to end a process. The Task Manager opens with the Processes tab. With the window displayed, select a process you want to end and click the End Process button. Note: Be careful when ending a process. If you close a program, you lose unsaved data. If you end a system service, some part of the system might not function properly. If you want to end a process and all processes which are created by it, on the Processes tab, right-click the process you want to end, and then click End Process Tree. I need help - where can I get support? Fix my PC: If you’re struggling with an unresponsive computer or suspect you have a virus, the tools found in Fix my PC are designed to help you. FAQ: We’ve compiled a list of answers to the most frequently asked questions about our products' features or how to use them, as well as other valuable information about the company and cybersecurity. Support for adaware antivirus: All the information you need to get adaware antivirus working for you. Some topics covered here are how to install & activate the software, how to repair or uninstall, or submitting a tech support ticket. Support for adaware ad block: Your ressource to get the best out of adaware ad block. Some of the topics covered in this section are about maximizing your usage of the product with guides on how to install, use and uninstall the software. Forum: Your space for engaging the adaware community for product-related questions and best practices. Product Manuals: Our user guides can help you get started and get the most out of our software. If you are a paid user, you have access to one-on-one technical support by phone. At the time of purchase, you should have received the necessary contact information in a confirmation email. If you've misplaced that information, login to your My adaware account.